The Slocan Valley is quirky and isolated, and its past can be told in many ways. The valley has been a site of conflict between capital and labour on an industrial mining frontier, a haven for refugees from Czarist Russia, a locus of family life on semi-subsistent farms, a set of camps during World War II for Japanese evacuated from the coast, a favoured resort in the late 1960s and early 1970s for young Americans fed up with their country, a place where the economy stalled, many left, and in various ways the remainder managed to get by. None of these tellings is wrong. The modern Slocan began in a mining boom, but thereafter became home to a variety of people and to sputtering economies. Such consistency as there has been has to do with a sense of a place apart, a refuge from the insanities of the larger world. 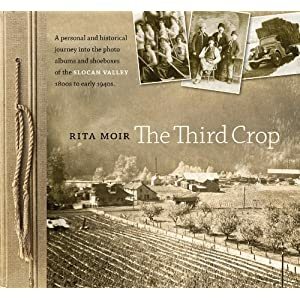 Rita Moir arrived in the Slocan in the early 1970s and became a central figure at the Vallican Whole, a community hall that emerged out of the lower Slocan Valley’s then vibrant counterculture. Since, she has become a staff journalist (for the Nelson Daily News) and freelance writer, and has written three previous books, one of which, Buffalo Jump: A Woman’s Travels, won the Hubert Evans award for non-fiction. A third crop is a rare extra crop of hay, harvested in the fall and laboriously fixed to drying poles. Moir intends it as a metaphor for those who put the hard extra work into making life and community in the Slocan, but it is also a metaphor for her work for this book. Her third crop is photographs, some from public collections, more from family albums, shoeboxes, and attics. This book began with conversations around kitchen tables. Many of the pictures she has found are marvellous, and she has let them “do the talking.” Hers is not a representative collection, nor probably could be. There is much more on the lower valley, where she lives, than the upper valley; much more on the years that albums and attics in the lower valley might be expected to uncover – from about 1910 to the early 1940s – than on the mining boom. Almost all the pictures of the latter are from public collections. The strengths of her collection are these: intimate views of rural life in the lower Slocan Valley, previously unknown or little-known pictures of logging operations and sawmills in the lower Slocan Valley, intimate views of Japanese life during the internment. 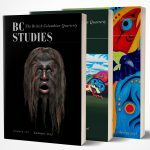 The Doukhobors also figure, and there are remarkable pictures of sporting life, particularly of two young women in long skirts on the trail to the New Denver glacier, and an outlandish party of four roped together on the Kokanee Glacier. Enjoy this book for the pictures. It is not academic history, nor is it always accurate. But taken for what it is, an affectionate gleaning of tucked-away photos, it is delightful and fascinating.